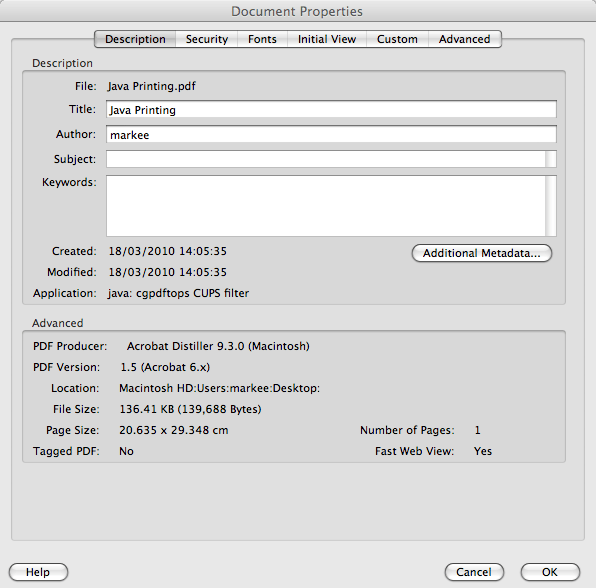 The size of a PDF is generally defined by the CropBox or MediaBox setting for each page. This is the number of pixels. This provides a set of 4 number (x,y,width,height) to define how big the page is. A common value is 0 0 595 842 for an A4 page. So where does this number of centimetres come from? Standard dpi is 72 dots per inch so we can convert the CropBox and MediaBox to inches by dividing these numbers by 72. This gives us 8.125 inches by 11.556 inches. So that is how Adobe creates the size from the raw PDF Crop or Media box sizes. If you are interested in using JPedal to generate the size values of each page, here is a simple example.